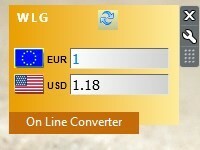 New Exchange Rates lets you convert several currencies or monitor constantly a pair of currencies easily on your desktop. If you prefer a gadget that supports even more currencies, get the free Currency Monitor. A sister gadget to Exchange Rates, this one adds support for Thailand Baht and South African Rand, and remains connected with the On Line Currency Converter for more currencies. It also features larger font size for easier reading. The gadget is elegant and simple, and it remembers your choice of currencies. Note: If you prefer a smaller version that conforms with Windows standards, get the SM version. In case that you have magnified (scaled) your desktop, you may prefer the larger version of this gadget, the New Exchange Rates XL.